The display industry plans for massive expansion of Gen 10.5 capacity, which will enable efficient production of 65” and 75” display panels for both LCD and OLED TV. Capacity of Gen 10+ substrates for displays is expected to increase from 8 million square meters in 2017 to at least 75 million square meters in 2022. Total manufacturing costs for 8K 65” LCD panels are estimated at $1000 per panel currently and are expected to be reduced to $595 by 2021. Costs for OLED panels are estimated at $1830 today and the report includes cost estimates in 2021. 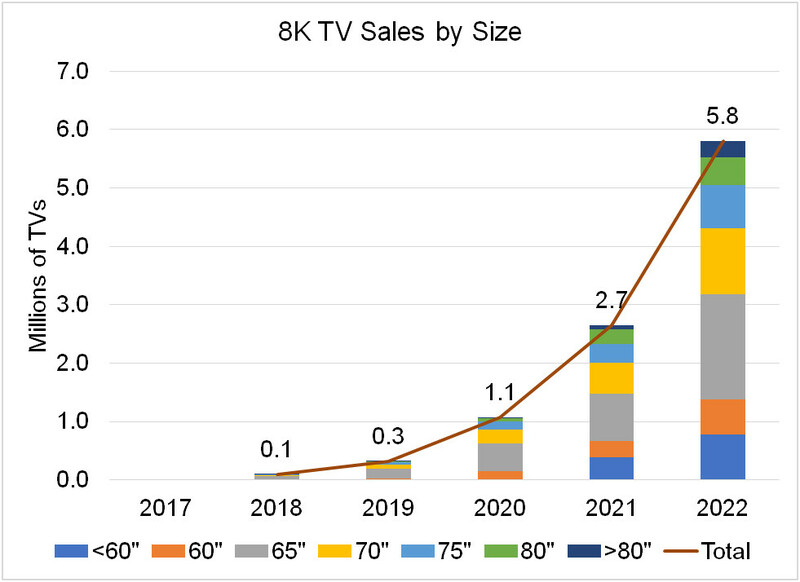 8K TVs are expected to include advanced features like HDR, wide color gamut and advanced upscaling. Native 8K content will be limited so upscaling will be a differentiating feature. “While the benefit of simply increasing pixel count from 4K to 8K is weak except for the largest TV sizes, there will be significant panel and TV supplier ‘push’ that will foster adoption in a way that is similar to the 4K adoption pattern, but at a slower pace,” noted Chris Chinnock, President/Founder of Insight Media. Insight Media is a consultancy focused on emerging display-related technologies and products in the cinema, broadcast, ProAV, consumer electronics and display industries. Insight Media offers consulting and writing services and organizes display-driven events focusing on 8K, HDR, wide color gamut, microLEDs, training and simulation, VR/AR and other emerging trends. To see how we can help your organization, contact us at info@insightmedia.info or 203-831-8464.